At Alpha Novae, we do not agree with the ones (in particular the brokers…) explaining you that costs associated to each one of your trades are just a detail. Indeed, in the long term, we know that costs often make the difference between a successful manager and a loosing one. AlphaTrader aims at targetting every components of your trading costs. Thanks to its trade centric Virtual Order Manager layer allowing virtual hedging but netting positions, and AlphaTrader Internal Matching engine, it is possible to open pairs of buy/short globally flat trades without paying any spread or commissions. A strategy opening a pair buy/sell totally hedged will cost 0 spread and 0 commissions on AlphaTrader. – several algorithms to implement more or less passive liquidity providing tactics. – multi-leg algorithm to reduce spread on exotic pairs. For exemple: NZDSGD = NZDUSD + USDSGD. Finally, about Forex and CFDs, orders can be sent to the first and currently only one exchange (MTF) for Spot Forex and CFDs: the LMAX Exchange. Liquidity Providers are directly competing on a central book with low latency access and no last look, allowing spreads to be as thin as possible. 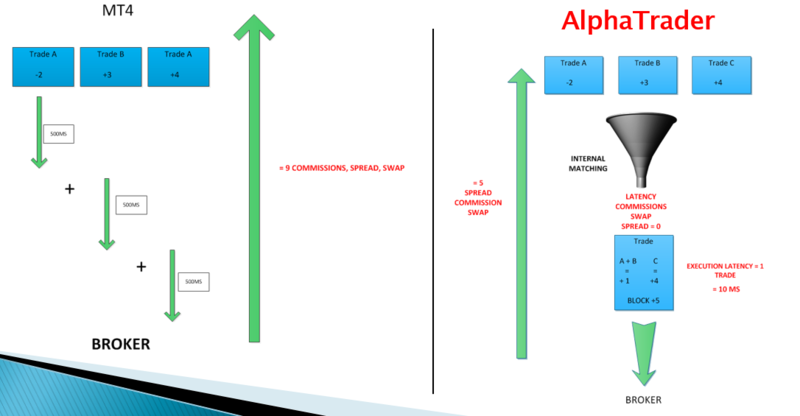 As explained above, thank to its Internal Matching engine, AlphaTrader allows to match imternally buy/short orders without paying any spread or commissions. In addition to that, you can get access with AlphaTrader to competitive and transparent commissions ($/millions) with volume based discounts (cf our offer with the LMAX Exchange). Commissions which will be always lower than on a MT4 access, whatever your trading volumes. With a roundtrip execution time in a few milliseconds thanks to a Direct Market Access to the central order book, slippages created by market movements during the time your orders take to hit the market can always happen but are very unlikely. AlphaTrader execution reports will notice you of any slippage. In addition to that, AlphaTrader block merge engine allows to faster your execution by merging all your different trades to be sent to the broker in one single block. Instead of filling one trade after the other, your block will be filled in one go. AlphaTrader AlgoBox proposes also the “Sniping” algorithm for automated or manual trading, that will allow you to be sure to be executed without any slippages. Your order would be cancelled if any slippages would happen. More information on slippages and AlphaTrader here. Thanks to our “Sniping” algorithm you can make sure to only hit the top of the book liquidity (available at best bid or ask). You can also create algorithms to control the slippages produced by walking the book or using fragmentation to let liquidity provider recharging their liquidity offering. AlphaTrader sending your order to an exchange where last look is not authorized, you will not experience extra slippages when market is volatile. This is particularly important for any scalping or momentum based strategies. Being an exchange, obviously your orders will not be delayed or manipulated by dealer activities. On daily overnight roll over, swap are exchanged and positions financed. Thanks to its trade centric Virtual Order Manager layer allowing virtual hedging but netting positions, your overnight financing charge will be reduced to its minimum amount. If you are long 1 lot and short 1 lot on the same instrument in same time, you will pay no financial charges. – On MT4, you have 1 long Buy + 1 long Short + 1 long Buy. If you execute block trades, you could be impacted by market reactions during your trade execution and being gamed by predator algorithms. AlphaTrader allows to write any anti gaming algorithms to hide your intentions. We will not detail here market impacts and reactions as it would require a full article. But if you execute block trades, you could be impacted by market reactions during your trade execution and being gamed by predator algorithms. AlphaTrader allows to write any anti gaming algorithms to hide your intentions and get better execution. All these elements allow you to save points or pips to any of your trade. Let say you can save an average of 0.25 pips (one quarter of pip) on each of your execution. Making 0.5 pips for a trade opened and closed. If you open and close daily 25 EURUSD trades of 1 lot, you will save: 25 trades * 20 days per month * 0.5 pips per roundtrip = 250 pips/month. Which makes 2500 dollars saved monthly on your trading if using 100 leverage!